Bang! You’re dead! We knew it as cops and robbers as kids, but since we’re all adults now, let’s upgrade to something a bit more interesting. The Penn State Urban Gaming Club will be starting up its Humans vs. Zombies game, which it does every semester, on March 22 (If you don’t remember, these were the ones running around early in the fall with Nerf guns and other assorted weapons). Spring is supposedly coming, although I have yet to see any evidence of that. But Humans vs. Zombies promises to be a fun way to blow off steam once the risk of frostbite lessens somewhat. Here’s how it works, in brief: at first, there’s only one zombie against everyone else – and the zombie infects humans by tagging them anywhere, after which the human becomes a zombie. However, the humans are armed with various makeshift weapons (marshmallows, among other things). 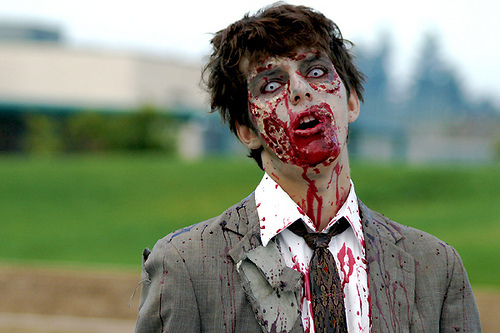 If a zombie gets hit, he/she is “stunned” for 15 minutes and can’t attack. It seems improbable, but the zombies have won the past five games. To participate, you have to register with the Urban Gaming Club on their website, and registration starts March 1 and lasts through March 20. Humans vs. Zombies is just one of the games the Urban Gaming Club plays. Others include Capture the Flag, Scavenger Hunts, Assassins, and many others. The club was founded in 2006, meaning they have already thoroughly outlasted urban games such as the likes of parkour. Their secretary, Martin Castner, says that he’s trying to get the word out “in order to prevent people from getting frightened and surprised by [their] games.” Point taken. However, I, for one, would welcome Humans vs. Zombies or Manhunt with open arms. Also, how sweet would it be to get a campus-wide game of any of these games going?